Okay, let’s just see a quick show of hands… How many of you already own a heart rate monitor of some description? Okay, quite a few of you. Alright, keep your hands up if you know how to use your HRM? Hmmm, okay, a few hands went down. Quizzical looks on a lot of faces are telling me that a lot of you sort of know how to use your HRM, but are not sure. Okay, one more round of questions, then: How may of you know about heart rate training zones? Okay, quite a few of put your hands up. Now, keep your hands up if you know about your heart rate training zones, as in your Max HR, your Aerobic Endurance zone, your Tempo zone, and so forth. A few hands went down, but some more quizzical looks on faces. You see, the problem is that, before I go and recommend which heart rate monitor you should buy for your training, I have to acknowledge that there is a lot of confusion and margin for error in this whole area of training with heart rate zones, which is why most of us buy an HRM. So, I am afraid I feel the need to bore you with some explanations, in an attempt to clear up some of that confusion and reduce some of that margin for error. Then, we’ll get to the gadget stuff in a few minutes. If you read some of the web sites, magazine articles, books or HRM owner’s manuals, it sounds like heart rate training zones can be calculated fairly quickly and then you can head off to do your exercise, confident that you are targeting a specific type of fitness. But, they’re not so easy to calculate accurately and most calculations that don’t involve a scientific test (usually something like a VO2max test) are going to be prone to a lot of error. Problem is that a VO2max test can be expensive ($100-200 or more), can be time consuming (about an hour in total), and require specialists to conduct them. It is sooooo much easier just to follow the “typical guidelines” and then get started than it is to find the time, money and appropriate specialist to do a VO2max test. But, let me give you an example of how badly you can get it wrong if you follow some of the “typical guidelines”. Many will tell you to take the number 220 and subtract your age if you want to estimate your Maximum Heart Rate for running. So, a 45 year-old guy like myself should have a maximum heart rate of 175 beats per minute (bpm). Except, my Max HR was tested on a treadmill last year (need to get another test done this year, sorry for the old numbers) at 188 bpm. So, if I follow the “typical guideline” and decide I want to target a tougher training zone for intervals on the track, they tell me I should train at 80-85% of my Max HR, or a Tempo training zone of 140-149 bpm. Which would be completely wrong for me, because I found out last year that my Tempo training zone is 151-161 bpm (80-86% of Max HR). The 140-149 bpm zone would be totally counter-productive for me – not hard enough to be improving my speed or power, but too hard to develop aerobic endurance, and I would not see the kinds of fitness gains I had hoped for if I followed the “typical guidelines”. So, if you want to take this stuff seriously, then get a VO2max test done by an experienced professional and get more out of your training and your HRM. The other approach you could take would be much less expensive, much more time-consuming, require you to listen to your body, and won’t give you any useful numbers for a while. You could use a heart rate monitor and write down your heart rates at key points in your work-outs (you’ll have to talk to your coach about this for more specific details), and then after several months of regular recording of your numbers, alongside your pacing and Rates of Perceived Exertion, then it might be possible to estimate your personal heart rate training zones. Well, the good news is that you don’t need to go out and buy the latest and most expensive HRM on the market. Of course, the latest and most expensive HRM on the market might have all the features you’d really like to have in an HRM (GPS mapping for speed, distance and route maps, downloadable to your computer, totally waterproof, extended battery life up to 20 hours, perfect for iron-distance triathletes…), like the Garmin Forerunner 310xt pictured to the right there ($300-400). But, there are also plenty of lower priced heart rate monitors that do a great job and cost about 1/4 the price. So, what would I say are the most useful minimum set of features that an HRM needs to have? My favorite heart rate monitor in the “entry-level” category, that fits all the criteria mentioned above, sadly, is not made any more. It is a Nike Triax C8, it cost me about $80 five years ago, and it still works brilliantly to this day. Sadly, Nike seems to be more focused on footwear and watches that make fashion statements and I could not find any new HRMs currently available that I would recommend. 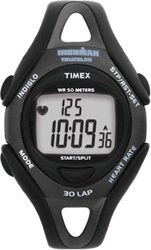 However, Timex do make some HRMs that are very reasonably priced and seem to have all the features mentioned above. I owned an Ironman-branded Timex watch before I had the Nike Triax HRM and it was very good value for money (but it was not an HRM) and lasted through my first 3 years of triathlon training in all kinds of water, weather and conditions. The Ironman Race Trainer model, pictured to the left, seems to be a very good one with all the features you might need to get started (and it can cost a lot less if you buy it on Amazon). Garmin also do some very good models that are not as expensive as the 310xt. For example, I own a Forerunner 305 (the one pictured at the top of the article on my wrist) that costs about half of what the 310xt costs and is great for long runs. It is not water-proof, so I can’t wear it when I swim, and the battery life is only estimated for 8 hours, so I can’t use it for iron-distance training or racing situations. But, it has been so useful to have GPS distance and speed measurements available for the lower price. There are still a lot of other factors you may want to consider when buying and HRM. Is the heart rate strap compatible with your turbo trainer? Your treadmill? Your cycle computer? Will it work with Nike+ and iPod accessories? Other gadgets you might use in your training? How does it feel when you are wearing it (the Garmin HRMs shown here in this article are very bulky and uncomfortable)? These are also important questions to think about, and don’t make your purchasing decision any quicker or easier, but can make your usage of the HRM a lot more beneficial in your training. HeartRateMonitor.co.uk is an excellent resource for people in the UK, and HeartRateMonitorsUSA.com for people in the US, who want to learn more about heart rate monitors, features, and objective product reviews, alongside an impressive range of products for sale on their web sites. So, check them out, too, and get as much information as you can handle before making your purchase.